VSPARS is set up to automatically start logging data when the PC is switched on so results are generated with no user input required. Criteria can be applied to ensure the fidelity of the data being sent out and increasing the automation of the system. 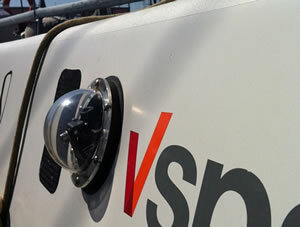 The Quantum team have tailored the VSPARS install to suit their exact needs. 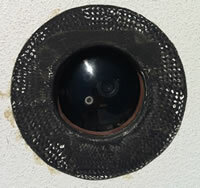 The mainsail camera sits on the inside of the cockpit which fitted with their requirements whilst still getting a full view of the main and rig. The jib camera is recessed into the foredeck meaning to bowman doesn't have an extra obstacle to deal with during manoevres. Quantum also used a lightweight low power FitPc to run VSPARS, using RDP via a portable deck screen to view and configure VSPARS. Andrew Scott from Quantum Racing has been responsible for setting up the system - “Within a half hour of setup and calibration we had live stripe recognition running on both tacks on the mainsail. The system then ran all day, generating results in real time and at the close of sailing we were able to filter all results by time and/or conditions (AWA etc.) 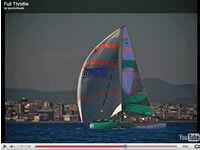 to generate average sail shapes for key moments. With one click, these can be output as PDFs and 3D coordinate files for our sailors and designers." The team at VSPARS wishes Quantum Racing well for the rest of the series!